Pre-contact distribution of Uto-Aztecan languages. Uto-Aztecan or Uto-Aztekan /ˈjuːtoʊ.æzˈtɛkən/ is a family of indigenous languages of the Americas, consisting of over 30 languages. 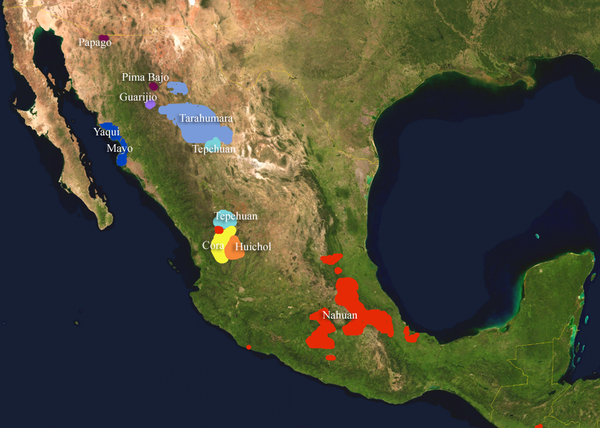 Uto-Aztecan languages are found almost entirely in the Western United States and Mexico. The name of the language family was created to show that it includes both the Ute language of Utah and the Nahuan languages (also known as Aztecan) of Mexico. The Uto-Aztecan language family is one of the largest linguistic families in the Americas in terms of number of speakers, number of languages, and geographic extension. The northernmost Uto-Aztecan language is Shoshoni, which is spoken as far north as Salmon, Idaho, while the southernmost is the Pipil language of El Salvador. Ethnologue gives the total number of languages in the family as 61, and the total number of speakers as 1,900,412. The roughly 1.7-1.9 million speakers of Nahuatl languages account for almost four-fifths (78.9%) of these. The internal classification of the family often divides the family into two branches: a northern branch including all the languages of the US and a Southern branch including all the languages of Mexico, although it is still being discussed whether this is best understood as a genetic classification or as a geographical one. Below this level of classification the main branches are well accepted: Numic (including languages such as Comanche and Shoshoni) and the Californian languages (formerly known as the Takic group, including Cahuilla and Luiseño) account for most of the Northern languages. Hopi and Tübatulabal are languages outside those groups. The Southern languages are divided into the Tepiman languages (including O'odham and Tepehuán), the Tarahumaran languages (including Raramuri and Guarijio), the Cahitan languages (including Yaqui and Mayo), the Coracholan languages (including Cora and Huichol), and the Nahuan languages. The homeland of the Uto-Aztecan languages is generally considered to have been in the Southwestern United States or possibly Northwestern Mexico. An alternative theory has proposed the possibility that the language family originated in southern Mexico, within the Mesoamerican language area, but this has not been generally considered convincing. Proto-Uto-Aztecan is the hypothetical common ancestor of the Uto-Aztecan languages. Authorities on the history of the language group have usually placed the Proto-Uto-Aztecan homeland in the border region between the United States and Mexico, namely the upland regions of Arizona and New Mexico and the adjacent areas of the Mexican states of Sonora and Chihuahua, roughly corresponding to the Sonoran Desert and the western part of the Chihuahuan Desert. It would have been spoken by Mesolithic foragers in Aridoamerica, about 5,000 years ago. Reconstructions of the botanical vocabulary offer clues to the ecological niche inhabited by the Proto-Uto-Aztecans. Fowler placed the center of Proto-Uto-Aztecan in Central Arizona with northern dialects extending into Nevada and the Mojave desert and southern dialects extending south through the Tepiman corridor into Mexico. The homeland of the Numic languages has been placed in Southern California near Death Valley, and the homeland of the proposed Southern Uto-Aztecan group has been placed on the coast of Sonora. A contrary proposal suggests the homeland of Proto-Uto-Aztecan to have been much farther to the south; it was published in 2001 by Jane H. Hill, based on her reconstruction of maize-related vocabulary in Proto-Uto-Aztecan. By her theory, the assumed speakers of Proto-Uto-Aztecan were maize cultivators in Mesoamerica, who gradually moved north, bringing maize cultivation with them, during the period of roughly 4,500 to 3,000 years ago. The geographic diffusion of speakers corresponded to the breakup of linguistic unity. The hypothesis has been criticized on several grounds, and it is not generally accepted by Uto-Aztecanists. Using computational phylogenetic methods, Wheeler & Whiteley (2014) also suggest a southern homeland for Proto-Uto-Aztecan in or near the area occupied by historical Cora and some Nahua. Nahuatl forms the most basal clade in Wheeler & Whiteley's (2014) Uto-Aztecan phylogram. A survey of agriculture-related vocabulary by Merrill (2012) found that the agricultural vocabulary can be reconstructed for only Southern Uto-Aztecan. That supports a conclusion that the Proto-Uto-Aztecan speech community did not practice agriculture but adopted it only after entering Mesoamerica from the north. A recent proposal, by David L. Shaul, presents evidence suggesting contact between Proto-Uto-Aztecan and languages of central California, such as Esselen and the Yokutsan languages. That leads Shaul to suggest that Proto-Uto-Aztecan was spoken in California's Central Valley area, and it formed part of an ancient Californian linguistic area. Proto-Uto-Aztecan is reconstructed as having an unusual vowel inventory: *i *a *u *o *ɨ. Langacker (1970) demonstrated that the fifth vowel should be reconstructed as *ɨ as opposed to *e, and there has been a long-running dispute over the proper reconstruction. *n and *ŋ may have actually been *l and *n, respectively. Uto-Aztecan languages are spoken in the North American mountain ranges and adjacent lowlands of the western United States (in the states of Oregon, Idaho, Montana, Utah, California, Nevada, Arizona) and of Mexico (states of Sonora, Chihuahua, Nayarit, Durango, Zacatecas, Jalisco, Michoacán, Guerrero, San Luis Potosí, Hidalgo, Puebla, Veracruz, Morelos, Estado de México, and Ciudad de México. Classical Nahuatl, the language of the Aztecs, and its modern relatives are part of the Uto-Aztecan family. The Pipil language, an offshoot of Nahuatl, spread to Central America by a wave of migration from Mexico, and formerly had many speakers there. Now it has gone extinct in Guatemala and Honduras, and it is nearly extinct in western El Salvador, all areas dominated by use of Spanish. Uto-Aztecan has been accepted by linguists as a language family since the early 1900s, and six subgroups are generally accepted as valid: Numic, Takic, Pimic, Taracahitic, Corachol, and Aztecan. That leaves two ungrouped languages: Tübatulabal and Hopi (sometimes termed "isolates within the family"). Some recent studies have begun to question the unity of Taracahitic and Takic and computer-assisted statistical studies have begun to question some of the long-held assumptions and consensuses. As to higher-level groupings, disagreement has persisted since the 19th century. Presently scholars also disagree as to where to draw language boundaries within the dialect continua. The similarities among the Uto-Aztecan languages were noted as early as 1859 by J. C. E. Buschmann, but he failed to recognize the genetic affiliation between the Aztecan branch and the rest. He ascribed the similarities between the two groups to diffusion. Daniel Garrison Brinton added the Aztecan languages to the family in 1891 and coined the term Uto-Aztecan. John Wesley Powell, however, rejected the claim in his own classification of North American indigenous languages (also published in 1891). Powell recognized two language families: "Shoshonean" (encompassing Takic, Numic, Hopi, and Tübatulabal) and "Sonoran" (encompassing Pimic, Taracahitan, and Corachol). In the early 1900s Alfred L. Kroeber filled in the picture of the Shoshonean group, while Edward Sapir proved the unity among Aztecan, "Sonoran", and "Shoshonean". Sapir's applications of the comparative method to unwritten Native American languages are regarded as groundbreaking. Voegelin, Voegelin & Hale (1962) argued for a three-way division of Shoshonean, Sonoran and Aztecan, following Powell. As of about 2011, there is still debate about whether to accept the proposed basic split between "Northern Uto-Aztecan" and "Southern Uto-Aztecan" languages. Northern-Utoaztecan corresponds to Powell's "Shoshonean", and the latter is all the rest: Powell's "Sonoran" plus Aztecan. Northern Uto-Aztecan was proposed as a genetic grouping by Jeffrey Heath (1978) based on morphological evidence, and Manaster Ramer (1992) adduced phonological evidence in the form of a sound law. Kaufman (1981) accepted the basic division into Northern and Southern branches as valid. Other scholars have rejected the genealogical unity of either both nodes or the Northern node alone. Miller's argument was statistical, arguing that Northern Uto-Aztecan languages displayed too few cognates to be considered a unit. On the other hands he found the number of cognates among Southern Uto-Aztecan languages to suggest a genetic relation. This position was supported by subsequent lexicostatistic analyses by Cortina-Borja & Valiñas-Coalla (1989) and Cortina-Borja, Stuart-Smith & Valiñas-Coalla (2002). Reviewing the debate, Haugen (2008) considers the evidence in favor of the genetic unity of Northern Uto-Aztecan to be convincing, but remains agnostic on the validity of Southern Uto-Aztecan as a genetic grouping. Hill (2011) also considered the North/South split to be valid based on phonological evidence, confirming both groupings. Merrill (2013) adduced further evidence for the unity of Southern Uto-Aztecan as a valid grouping. Hill (2011) also rejected the validity of the Takic grouping decomposing it into a Californian areal grouping together with Tubatulabal. Some classifications have posited a genetic relation between Corachol and Nahuan (e.g. Merrill (2013)). Kaufman recognizes similarities between Corachol and Aztecan, but explains them by diffusion instead of genetic evolution. Most scholars view the breakup of Proto-Uto-Aztecan as a case of the gradual disintegration of a dialect continuum. In addition to the above languages for which linguistic evidence exists, it is suspected that among dozens of now extinct, undocumented or poorly known languages of northern Mexico, many were Uto-Aztecan. A large number of languages known only from brief mentions are thought to have been Uto-Aztecan languages that became extinct before being documented. ^ Hammarström, Harald; Forkel, Robert; Haspelmath, Martin, eds. (2017). "Uto-Aztecan". Glottolog 3.0. Jena, Germany: Max Planck Institute for the Science of Human History. ^ a b Caballero 2011. ^ Ethnologue (2014). "Summary by language family". SIL International. Retrieved July 2, 2014. ^ Kemp et al. 2010, . ^ Merrill et al. 2010, . ^ Campbell & Poser 2008, p. 346-350. ^ Campbell 1997, p. 136. ^ Goddard 1996, p. 7. ^ Miller 1983, p. 118. ^ a b Miller 1984. ^ Mithun 1999, p. 539-540. ^ Campbell 1997, pp. 133–135. Brown, Cecil H. (2010). "Lack of linguistic support for Proto-Uto-Aztecan at 8900 BP (letter)". Proc. Natl. Acad. Sci. USA. 107 (15): E34, author reply E35–6. doi:10.1073/pnas.0914859107. PMC 2841887. PMID 20231478. Caballero, G. (2011). "Behind the Mexican Mountains: Recent Developments and New Directions in Research on Uto‐Aztecan Languages". Language and Linguistics Compass. 5 (7): 485–504. doi:10.1111/j.1749-818x.2011.00287.x. Campbell, Lyle (1997). American Indian Languages: The Historical Linguistics of Native America. Oxford University Press. Campbell, Lyle (2003). "What drives linguistic diversification and language spread?". In Bellwood, Peter; Renfrew, Colin (eds.). Examining the farming/language dispersal hypothesis. Cambridge(U.K.): McDonald Institute for Archaeological Research. pp. 49–63. Campbell, Lyle; Poser, William J. (2008). Language classification, history and method. Cambridge University Press. Cortina-Borja, M; Valiñas-Coalla, L (1989). "Some remarks on Uto-Aztecan Classification". International Journal of American Linguistics. 55 (2): 214–239. doi:10.1086/466114. Cortina-Borja, M.; Stuart-Smith, J.; Valiñas-Coalla, L. (2002). "Multivariate classification methods for lexical and phonological dissimilarities and their application to the Uto-Aztecan family". Journal of Quantitative Linguistics. 9 (2): 97–124. doi:10.1076/jqul.9.2.97.8485. Dakin, Karen (1996). "Long vowels and morpheme boundaries in Nahuatl and Uto-Aztecan: comments on historical developments" (PDF). Amerindia. 21. Fowler, Catherine S. (1983). "Some lexical clues to Uto-Aztecan prehistory". International Journal of American Linguistics. 49 (3): 224–257. doi:10.1086/465789. Goddard, Ives (1996). "Introduction". In Goddard, Ives (ed.). Handbook of North American Indians. 17. Washington, D.C.: Smithsonian Institution. pp. 1–16. Haugen, J. D. (2008). Morphology at the interfaces: reduplication and noun incorporation in Uto-Aztecan. Vol. 117. John Benjamins Publishing. Heath, J. (1978). "Uto-Aztecan* na-class verbs". International Journal of American Linguistics. 44 (3): 211–222. doi:10.1086/465546. Hill, Jane H. (December 2001). "Proto-Uto-Aztecan". American Anthropologist. New Series. 103 (4): 913–934. doi:10.1525/aa.2001.103.4.913. JSTOR 684121. Hill, Jane H. (2010). "New evidence for a Mesoamerican homeland for Proto-Uto-Aztecan". PNAS. 107 (11): E33, author reply E35–6. Bibcode:2010PNAS..107E..33H. doi:10.1073/pnas.0914473107. PMC 2841890. PMID 20231477. Hill, J. H. (2011). "Subgrouping in Uto-Aztecan. Language Dynamics and Change". Language Dynamics and Change. 1 (2): 241–278. doi:10.1163/221058212x643978. Iannucci, David (1972). Numic historical phonology. Cornell University PhD dissertation. Kaufman, Terrence (2001). Nawa linguistic prehistory. Mesoamerican Language Documentation Project. Kaufman, Terrence (1981). Lyle Campbell (ed.). Comparative Uto-Aztecan Phonology. Unpublished manuscript. Kemp; González-Oliver; Malhi; Monroe; Schroeder; McDonough; Rhett; Resendéz; Peñalosa-Espinoza; Buentello-Malo; Gorodetsky; Smith (2010). "Evaluating the farming/language dispersal hypothesis with genetic variation exhibited by populations in the Southwest and Mesoamerica". Proc. Natl. Acad. Sci. USA. 107 (15): 6759–6764. Bibcode:2010PNAS..107.6759K. doi:10.1073/pnas.0905753107. PMC 2872417. PMID 20351276. Kroeber, Alfred Louis (1907). Shoshonean dialects of California. The University Press. Retrieved 24 August 2012. Kroeber, Alfred Louis (1934). Uto-Aztecan Languages of Mexico. 8. University of California Press. Langacker, Ronald W. (1970). "The Vowels of Proto Uto-Aztecan". International Journal of American Linguistics. 36 (3): 169–180. doi:10.1086/465108. Langacker, R. W. (1977). An overview of Uto-Aztecan grammar. Summer Institute of Linguistics. Langacker, R. W. (1976). Non-distinct arguments in Uto-Aztecan. Berkeley: University of California Press. Manaster Ramer, Alexis (1992). "A Northern Uto-Aztecan Sound Law: *-c- → -y-¹". International Journal of American Linguistics. 58 (3): 251–268. JSTOR 3519784. Merrill, William L.; Hard, Robert J.; Mabry, Jonathan B.; Fritz; Adams; Roney; MacWilliams (2010). "Reply to Hill and Brown: Maize and Uto-Aztecan cultural history". Proc. Natl. Acad. Sci. USA. 107 (11): E35–E36. Bibcode:2010PNAS..107E..35M. doi:10.1073/pnas.1000923107. PMC 2841871. Merrill, W (2013). "The genetic unity of southern Uto-Aztecan". Language Dynamics and Change. 3: 68–104. Merrill, William L. (2012). "The Historical Linguistics of Uto-Aztecan Agriculture". Anthropological Linguistics. 54 (3): 203–260. doi:10.1353/anl.2012.0017. Miller, Wick R. (1986). "Numic Languages". In Warren L. d’Azevedo (ed.). Handbook of North American Indians, Volume 11, Great Basin. Washington: Smithsonian Institution. pp. Pages 98–106. Miller, Wick R. (1983). "A note on extinct languages of northwest Mexico of supposed Uto-Aztecan affiliation". International Journal of American Linguistics. 49 (3): 328–333. doi:10.1086/465793. Miller, Wick R. (1983). "Uto-Aztecan languages". In Ortiz, Alfonso (ed.). Handbook of North American Indians. 10. Washington, D.C.: Smithsonian Institution. pp. 113–124. Miller, Wick R. (1984). "The classification of the Uto-Aztecan languages based on lexical evidence". International Journal of American Linguistics. 50 (1): 1–24. doi:10.1086/465813. Mithun, Marianne (1999). The languages of Native America. Cambridge University Press. Sapir, E. (1913). "Southern Paiute and Nahuatl, a study in Uto-Aztekan". Journal de la Société des Américanistes. 10 (2): 379–425. doi:10.3406/jsa.1913.2866. Shaul, David L. (2014). A Prehistory of Western North America: The Impact of Uto-Aztecan Languages. University of New Mexico Press. Shaul, David L.; Hill, Jane H. (1998). "Tepimans, Yumans, and other Hohokam". American Antiquity: 375–396. Steele, Susan (1979). "Uto-Aztecan: An assessment for historical and comparative linguistics". In Campbell, Lyle; Mithun, Marianne (eds.). The Languages of Native America: Historical and Comparative Assessment. Austin: University of Texas Press. pp. 444–544. Voegelin, C. F.; Voegelin, F.; Hale, K. (1962). Typological and Comparative Grammar of Uto-Aztecan: Phonology. Memoirs of the International Journal of American Linguistics. 17. Waverly Press. Whorf, B. L. (1935). "THE COMPARATIVE LINGUISTICS OF UTO‐AZTECAN". American Anthropologist. 37 (4): 600–608. doi:10.1525/aa.1935.37.4.02a00050. Hopi Dictionary Project (1998). Hopi Dictionary: Hopìikwa Lavàytutuveni: A Hopi–English Dictionary of the Third Mesa Dialect With an English–Hopi Finder List and a Sketch of Hopi Grammar. Tucson: University of Arizona Press. Campbell, Lyle (1985). The Pipil Language of El Salvador. Mouton Grammar Library, no. 1. Berlin: Mouton de Gruyter. ISBN 978-3-11-010344-1. OCLC 13433705. Archived from the original on 2014-06-06. Retrieved 2014-06-06. Dayley, Jon P. (1989). "Tümpisa (Panamint) Shoshone Grammar". University of California Publications in Linguistics. 115. Givón, Talmy (2011). Ute Reference Grammar. Culture and Language Use Volume 3. Amsterdam:: John Benjamins Publishing Company. Jeanne, LaVerne Masayesva (1978). Aspects of Hopi grammar. MIT, dissertation. Voegelin, Charles F. (1935). "Tübatulabal Grammar". University of California Publications in American Archaeology and Ethnology. 34: 55–190. Voegelin, Charles F. (1958). "Working Dictionary of Tübatulabal". International Journal of American Linguistics. 24 (3): 221–228. doi:10.1086/464459. Robinson, Lila Wistrand; Armagost, James (1990). Comanche dictionary and grammar. publications in linguistics (No. 92). Dallas, Texas: The Summer Institute of Linguistics and The University of Texas at Arlington. Lamb, Sydney M (1958). A Grammar of Mono (PDF). PhD Dissertation, University of California, Berkeley. Retrieved July 8, 2012. Zigmond, Maurice L.; Booth, Curtis G.; Munro, Pamela (1991). Pamela Munro (ed.). Kawaiisu, A Grammar and Dictionary with Texts. University of California Publications in Linguistics. Volume 119. Berkeley, California: University of California Press. Nichols, Michael (1973). Northern Paiute historical grammar. University of California, Berkeley PhD dissertation. McLaughlin, John E. (2012). Shoshoni Grammar. Languages of the World/Meterials 488. Muenchen: LINCOM Europa. Press, Margaret L. (1979). Chemehuevi, A Grammar and Lexicon. University of California Publications in Linguistics. Volume 92. Berkeley, California: University of California Press. Sapir, Edward (1992) . "Southern Paiute, a Shoshonean Language". In William Bright (ed.). The Collected Works of Edward Sapir, X, Southern Paiute and Ute Linguistics and Ethnography. Berlin: Mouton deGruyter. Seiler, Hans-Jakob (1977). Cahuilla Grammar. Banning, California: Malki Museum Press. Hill, Kenneth C. (1967). A Grammar of the Serrano Language. University of California, Los Angeles, PhD dissertation. Hill, Jane H. (2005). A Grammar of Cupeño. University of California Publications in Linguistics. Berkeley: University of California Press. Caballero, Gabriela (2008). Choguita Rarámuri (Tarahumara) Phonology and Morphology (PDF). PhD Dissertation: University of California at Berkeley. Thornes, Tim (2003). A Northern Paiute Grammar with Texts. PhD Dissertation: University of Oregon at Eugene. Kroeber, Alfred L.; Grace, George William (1960). The Sparkman Grammar of Luiseño. University of California Publications in Linguistics 16. Berkeley: The University of California Press. Zepeda, Ofelia (1983). A Tohono O'odham Grammar. Tucson, Arizona: The University of Arizona Press. Willett, T. (1991). A reference grammar of southeastern Tepehuan (PDF). Dallas: Summer Institute of Linguistics and University of Texas at Arlington. Mason, J. Alden (1916). "Tepecano, A Piman language of western Mexico". Annals of the New York Academy of Sciences. 25 (1): 309–416. Bibcode:1916NYASA..25..309M. doi:10.1111/j.1749-6632.1916.tb55171.x. hdl:2027/uc1.c077921598. Miller, Wick R. (1996). La lengua guarijio: gramatica, vocabulario y textos. Mexico City: Instituto de Investigaciones Antropologicas, UNAM. Bascom, Burton W. (1982). "Northern Tepehuan". In Ronald W. Langacker (ed.). Studies in Uto-Aztecan Grammar, Volume 3, Uto-Aztecan Grammatical Sketches. Dallas: Summer Institute of Linguistics and the University of Texas at Arlington. pp. 267–393. Lionnet, Andrés (1978). El idioma tubar y los tubares. Segun documentos ineditos de C. S. Lumholtz y C. V. Hartman. Mexico, D. F:: Universidad Iberoamericana. Casad, Eugene H. (1984). "Cora". In Ronald W. Langacker (ed.). Studies in Uto-Aztecan grammar 4: Southern Uto-Aztecan grammatical sketches. Summer Institute of Linguistics Publications in Linguistics 56. Dallas: Summer Institute of Linguistics and the University of Texas at Arlington. pp. 153–149. Iturrioz Leza, José Luis; Ramírez de la Cruz, Julio (2001). Gramática Didáctica del Huichol: Vol. I. Estructura Fonológica y Sistema de Escritura. Departamento de Estudios en Lenguas Indígenas–Universidad de Guadalajara – Secretaria de Educación Pública. Dedrick, John; Casad, Eugene H. (1999). Sonora Yaqui Language Structures. Tucson, AZ: University of Arizona Press. ISBN 9780816519811. Freeze, Ray A. (1989). Mayo de Los Capomos, Sinaloa. Archivo de Lenguas Indígenas del Estado de Oaxaca, 14. 14. 166. México, D.F. : Instituto de Investigación e Integración Social del Estado de Oaxaca. Lionnet, Andrés (1986). Un idioma extinto de sonora: El eudeve. México: UNAM. ISBN 978-968-837-915-8. Estrada-Fernández, Zarina (1998). Pima bajo de Yepachi, Chihuahua. Archivo de Lenguas Indigenas de Mexico. Colegio de México. Munro, Pamela; Gabrielino/Tongva Language Committee (2008). Yaara' Shiraaw'ax 'Eyooshiraaw'a. Now You're Speaking Our Language: Gabrielino/Tongva/Fernandeño. Lulu.com. Launey, Michel (1986). Categories et operations dans la grammaire Nahuatl. Ph. D. dissertation, Paris IV. Shaul, D. L. (2001). The Opatan Languages, Plus Jova. Festschrift. INAH. This page was last edited on 17 April 2019, at 06:21 (UTC).